Different populations: visitors, employees, etc. Horizontal circulation from one room to another, and vertical (lifts and staircases). Optimal sizing of reception desks and incoming calls management. Extreme conditions at peak hours. Side flows of deliveries, technical staff, couriers. Limited capacity of common spaces (cafeteria, waiting room). Simulation provides many tools to validate a fluid circulation of user groups, to make sure parking access does not jam the main street, to test the response algorithm of lifts or the proper sizing of access control points, and anticipate flows in case of evacuation. 1 – The study aims the functional aspect of the system, that also includes other types of flows (cars, workstations, tools or various resources) : it’s a quite typical case of discrete simulation, ExtendSim should be favored to take into account many others aspects or constraints than persons going from one point to another. 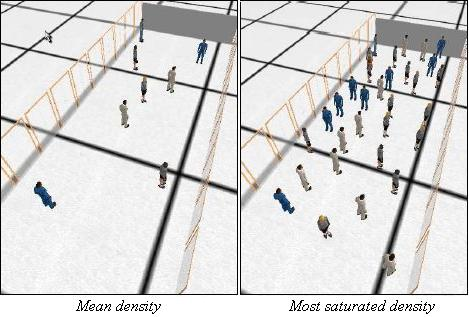 2 – The study focuses on pedestrians, that are precisely located within a known geometry (various buildings) that plays a large part in the constraints set on flows : it’s a case of multi-agent simulation to be rather treated with Pathfinder, because of the specific movement of persons, of the part played by their environment, of the 3D rendering of results.